I don't know about you, I like Stefanie Sun. Pride & Joy of Singapore. 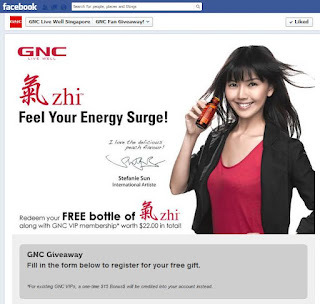 More than that I would like a free bottle of Zhi from GNC, it also comes with a free GNC VIP membership (worth $22 in total). Existing GNC VIP members get $15 credit. Fill up the form in FB and you will receive a redemption email.